The Second Day of Genesis 1 Describes … What?!? Then God said: ‘Let there be a rāqîaʿ in the midst of the waters, and let it keep separating the waters from the waters. So God made the rāqîaʿ, and he separated the waters which were under the rāqîaʿ from the waters which were above the rāqîaʿ. And it was so. 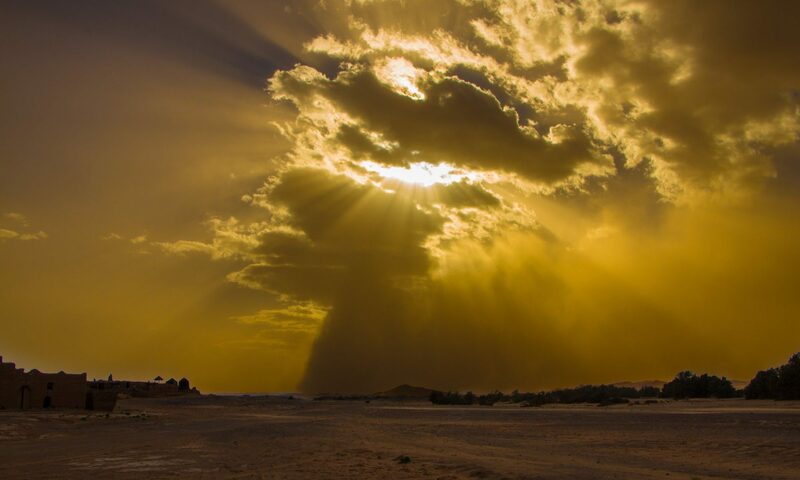 Then God named the rāqîaʿ: “Sky! (/ Heavens! )” And there was evening, and there was morning, the second day. For thousands of years this passage has been an enigma for interpreters of the Bible.1 What is the meaning of this word ‘rāqîaʿ,’ and what exactly were these waters that it divided? Was this simply describing the creation of the atmosphere? Do these upper waters simply refer to the clouds? Or are there details in this passage that make those interpretations problematic? Looking at this passage within its context, we must also wonder: What is it about this event that an entire day of creation was devoted to it? And what relation does it have to the works God performed on the other five days of creation? While it may come as a surprise to many, modern scholarship has long argued that the Hebrews, along with most other ancient peoples, believed that the heavens (as in ‘the sky’)2 were made of some kind of solid substance, whether it be of bronze, iron, or precious stone. This heavenly vault or dome had hatches in it, so it is argued, that released the waters that were contained above it. According to this view, this was the ancient explanation for where rain comes from. While this modern scholastic view goes well beyond what pious ancient interpreters thought, we can conveniently group together all views that thought of the rāqîaʿ as a solid object the firmament concept. ‘Firmament’ being the well-known King James Version translation of the Hebrew word rāqîaʿ. One may question if such a view is nothing more than a modern scholarly invention. As understandable as that would be, the very etymology and long-term usage of the (English) word firmament testifies that the notion of a cosmic ‘vault,’ or conversely of some kind of crystalline celestial sphere (which concepts, however, are far from identical),3 has long been believed in. Firmament is a transliteration of the Latin Vulgate’s firmamentum, the Vulgate being a 1,600 year old translation. The Vulgate itself was influenced by the Septuagint’s στερέωμα (stereōma), the Septuagint itself being a 2,300 year old translation. Stereōma comes from the word στερεόω (stereoō) – ‘to make or be firm or solid.’ While secular scholarship and conservative belief alike distinguish between the original intent of the Bible and later interpretations of it (no matter how old those interpretations may be), it is nonetheless a remarkable fact that the earliest ever translation of the Hebrew Bible, from circa 250 B.C., interpreted the rāqîaʿ as referring to some kind of hard heavenly object. Typically, those arguing for this alternative explanation imagined that this expanse (i.e. the rāqîaʿ itself) represented the atmosphere,4 as opposed to a solid cosmic vault. A crux of their argument was that even though the root word behind rāqîaʿ (rqʿ) can indeed denote the notion of solidity, that it could also denote the verbal notion of expansion. From this latter sense they advocated that the rāqîaʿ should be translated an expanse. Nonetheless, the proponents of the firmament view argue that even aside from this word’s etymology, there are many contextual and historical lines of evidence that seem to strongly support the firmament interpretation. I will refer to this consensus view as the firmament concept, and will only use the term ‘firmament’ when referring to that notion.5 Conversely, I will use the word rāqîaʿ and the designation rāqîaʿ concept as a way of referring to this scriptural entity in an interpretation neutral manner. It must be emphasized that the firmament concept is not limited to instances in which the word rāqîaʿ is used, which in fact only occurs in six chapters of the Bible. To the contrary, in the vast majority of cases in which a reference to the cosmic vault is supposed, the underlying Hebrew word is šāmayim or one of its synonyms rather than rāqîaʿ. The root rqʿ (the reader may pronounce this ‘raqah’) has the basic notion of stamping or of hammering something out thin, often in reference to a metallic substance. Numerous passages throughout the Bible seem to depict heaven as something solid, if not even as a solid vault (e.g. Job 37:18). 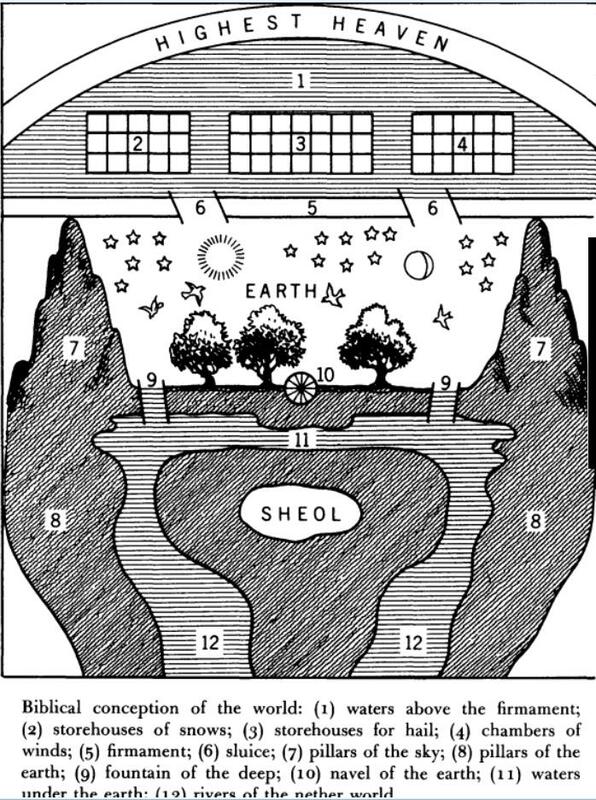 Occasional statements concerning the ‘windows of heaven’ as well as references to ‘the heavens being opened’ in conjunction with heavy rainfall (Gen 7:11) are thought to refer to hatches within the cosmic vault whose openings release the waters above. It is claimed that virtually all ancient peoples thought of “heaven” or of “sky” as being a solid object, or, that some such solid object existed within the (spacious) sky. Although used in an auxiliary manner, it is noted that the later Jewish and Christian interpretations anteceded today’s consensus view by as much as a couple thousand years. Do you interact with the scholarly works of Evangelicals who DO point out the Ancient Near Eastern background of Genesis 1, like John Walton and Michael Heiser? Thanks for posting Ed. I’m not sure where your emphasis is in that question, is it on the word “evangelical”, or simply on interacting with opposing scholarship? As this article briefly demonstrates, I am of course interacting with opposing scholarship. As for the prominent evangelicals making this case that you listed, as well as some others (e.g. Seely), yes, I do and will be interacting with their scholarship. Although I do not give them pride of place, since they simply build or expound upon the consensus view of secular biblical scholarship. I know of all the sources you just posted, and I have a marked up copy of Walton’s newer academic book by Eisenbrauns (where he backpedals on one very important point). I also am aware that Heiser is unfortunately strongly pushing this narrative as well. I think they are wrong on this issue, and that the truth is on the side that vindicates God’s Word from the claim that it supports a naive, mistaken cosmology. As for the prominent *evangelicals* making this case that you listed, as well as some others (e.g. Seely), yes, I do and will be interacting with their scholarship. Although I do not give them pride of place, since they simply build or expound upon the consensus view of secular biblical scholarship. I know of all the sources you just posted, and I have a marked up copy of Walton’s newer academic book by Eisenbrauns (where he backpedals on one very important point). I also am aware that Heiser is unfortunately strongly pushing this narrative as well. I think they are wrong on this issue, and that the truth is on the side that vindicates God’s Word from the claim that it supports a naive, mistaken cosmology. It is not much use calling the mainstream historical study of Genesis 1 “secular” in this case since ancient Near Easterners as well as early rabbis and church fathers (including Luther) agreed in writing about the rakia in a more or less solid fashion along with promoting the idea that vast celestial waters lie above the earth. Richard J. Clifford, Catholic Biblical Quarterly Monograph Series: Creation Accounts in the Ancient Near East and in the Bible 26 (Washington, DC: The Catholic Biblical Association of America, 1994). And the Christian scholars and their articles over at BIOLOGOS. There is a lot to interact with, beginning with first gaining an understanding of how ancient Egyptians and Mesopotamians viewed the cosmos–I don’t see much of that in your work. The overall ideas and terms in the Bible, sketchy as some phrases may be, does accord very well overall with ancient Near Eastern notions of a flat cosmos. You emphasized in a question if I interact with evangelical scholarship. A counterpart to that can be called ‘secular biblical scholarship.’ If you don’t like that term, I would rather not get in a protracted debate about mere terminology, it’s not worth the time. Ed, please read what I wrote more carefully. In this very article I make the case that we cannot just pass this issue off as merely an invention of modern secular biblical scholarship. See my sentence above: “One may question if such a view is nothing more than a modern scholarly invention. As understandable as that would be…” Even so, see what I wrote there, they were not simply arguing the same overall view as modern scholarship does either. As for the rest of your sources, I welcome you posting them here (well within reason, there have been two posts with long such lists now, that will suffice for now). The fact is, the purpose of this post was precisely to make clear how important this issue is, and to highlight the problem. The sources you list (again most of which I am familiar with) actually serve a good purpose. Far from hiding such scholarship, I was intending to highlight such scholarship! See my blockquotes in this article, they present the same kind of view you seem to think I am not interacting with. I don’t know why you seem to think I am not airing out the alternative view, it’s quite to the contrary. There is a lot to interact with, beginning with first gaining an understanding of how ancient Egyptians and Mesopotamians viewed the cosmos–I don’t see much of that in your work. Simply because I have barely got to publish any of my material yet, unfortunately (I hope that will change in the next year God willing). However, note that one of my major arguments is that this focus on ancient cosmologies in modern times has often missed the boat, in my view, even for understanding the non-biblical conceptions correctly. They have focused almost exclusively on eking out a physical cosmology in cases where it is almost ridiculous to make that the focus. You mentioned Othmar Keel, I have some wonderful citations that help illustrate that point (Keel does then often I feel not listen to his own advice, but the point is, some very important critiques on how modern scholarship works on these matters were noted by Keel himself). Further I make the case that the supposed other precedents for a firmament notion are ultimately mistaken. So yes, there is a lot to say about the non-biblical ancient cosmologies. Where does Walton recently deny that raquia has anything to do with firmness? Given this fresh analysis of šĕḥāqîm, I propose that rāqī ʿa refers to the space created when the šĕḥāqîm were put in place. This would explain why the birds and sun and moon are seen to be in the rāqī ʿa. Again, that Walton made this course change in his understanding of what the raqia represents was a big surprise to me, but even more pleasantly surprising was his recognition of the connection with Shu, which was the connection I had already made (though not published, but published to some friends privately by that time). Of course, he is still trying to find a solid firmament notion in the shehakim. You emphasized in a question if I interact with *evangelical* scholarship. A counterpart to that can be called ‘secular biblical scholarship.’ If you don’t like that term, I would rather not get in a protracted debate about mere terminology, it’s not worth the time. Ed, please read what I wrote more carefully. In this very article I make the case that we cannot just pass this issue off as *merely* an invention of modern secular biblical scholarship. See my sentence above: “One may question if such a view is nothing more than a modern scholarly invention. As understandable as that would be…” Even so, see what I wrote there, they were not simply arguing the same overall view as modern scholarship does either. As for the rest of your sources, I welcome you posting them here (well within reason, there have been two posts with long such lists now, that will suffice for now). The fact is, the purpose of this post was *precisely* to make clear how important this issue is, and to highlight the problem. The sources you list (again most of which I am familiar with) actually serve a good purpose. Far from hiding such scholarship, I was intending to *highlight* such scholarship! See my blockquotes in this article, they present the same kind of view you seem to think I am not interacting with. I don’t know why you seem to think I am not airing out the alternative view, it’s quite to the contrary. Simply because I have barely got to publish any of my material yet, unfortunately (I hope that will change in the next year God willing). However, note that one of my major arguments is that this focus on ancient cosmologies in modern times has often missed the boat, in my view, even for understanding the non-biblical conceptions correctly. They have focused almost exclusively on eking out a *physical* cosmology in cases where it is almost ridiculous to make that the focus. You mentioned Othmar Keel, I have some wonderful citations that help illustrate that point (Keel does then often I feel not listen to his own advice, but the point is, some very important critiques on how modern scholarship works on these matters were noted by Keel himself). Further I make the case that the supposed other precedents for a firmament notion are ultimately mistaken. So yes, there is a lot to say about the non-biblical ancient cosmologies. I think to deny that the Bible (in particular genesis 1) uses common themes from the ANE you need to have your head in the sand. Hello sir, I don’t think you could have read what I’ve written (though I’m sorry it’s not much more by now) very carefully and come to that conclusion. First a semantic caveat: I would word this a different way. I would not say that Genesis “uses” ANE themes, and actually, since it seems you are into Walton (from your other comment), not even Walton would state it quite that way (it’s been a bit, but he likes to talk about something like “shared cultural …” something or other, a quite different thing from one simply “uses” the other, I mostly agree with that). Instead, what I believe, and thus how I would state it, is that many ancient peoples (btw, NOT just ancient near eastern peoples, as if they were the only ancient peoples with shared traditions, we just have ANE traditions preserved the earliest) have parallels to the early Genesis history, though they are perverted and scrambled to various degrees. Let’s just pretend for the moment that all of us believe, as I do, that the Genesis history is true, and that it is a simple accurate account of the origins of the heavens and the earth (that it is even as young as that would make it, very recent). Just pretend you believe that for one moment Reginald. In that case a world-wide flood recently wiped out the earth, just less than 2000 years after the creation, and some 4000 years ago. Would we not expect all of mankind, who dispersed from the 3 sons of Noah (as described in Genesis 9-11) to have shared traditions about this event? Well, that is exactly what we have. So, of course I believe in shared traditions and parallel accounts, but most of the non-Scriptural parallels are filled with total absurdities. Yes, I know, many believe, as perhaps you do, that Hebrew scribes were just smart enough to de-mythologize such accounts, but no need to debate that here. What matters is, yes, I believe all of mankind had shared traditions and parallels for the early history of the earth, and that includes details from the creation week. On that matter, then, this is where you must not have read much of what I wrote (though again, unfortunately, I haven’t got to write much of my views on this still). If you look at my title page, ask yourself why I am citing something about the Egyptian god Shu, and about the god Χαος from Hesiod, parallel to Genesis 1:6? Answer: I believe these, and other examples, are amazing ancient parallels to the Genesis 1 raqia’! Namely, defined as an expansive gap of space (world-space, etc), not as a solid thin metal object in the sky. (So I am hardly denying parallels) Maybe you just didn’t read my next article where I make that clear, it’s the next linked to article after this one at the bottom, namely here. After I had come to these conclusions, I was gratified to see that Walton did a massive about-face and quit promoting that Genesis 1 describes a firmament, and that he made the connection with Shu. My jaw hit the ground when I first read this. So now Walton agrees with this! (Though obviously, he discerned that independently, given the timeline, but so did I). Though he now tries to place the firmament in Proverbs 8:28, and 1 or 2 other passages, see my article on the first of those on this site. I believed YECism was true. I studied ancient flood stories, geology, and left YECism after seeing its arguments crumble in the face of widespread evidence of an old earth and improbability of flood geology as an explanation. Nor are all ancient flood stories the same. In Egypt the flooding of the Nike brought life giving silt to keep their land fertile, so they lacked a catastrophic flood myth. First a semantic caveat: I would word this a different way. I would not say that Genesis “uses” ANE themes, and actually, since it seems you are into Walton (from your other comment), not even Walton would state it quite that way (it’s been a bit, but he likes to talk about something like “shared cultural …” something or other, a quite different thing from one simply “uses” the other, I mostly agree with that). Instead, what I believe, and thus how I would state it, is that many ancient peoples (btw, NOT just ancient *near eastern* peoples, as if they were the only ancient peoples with shared traditions, we just have ANE traditions preserved the earliest) have parallels to the early Genesis history, though they are perverted and scrambled to various degrees. Let’s just pretend for the moment that all of us believe, as I do, that the Genesis history is true, and that it is a simple accurate account of the origins of the heavens and the earth (that it is even as young as that would make it, very recent). Just pretend you believe that for one moment Reginald. In that case a world-wide flood recently wiped out the earth, just less than 2000 years after the creation, and some 4000 years ago. Would we not expect all of mankind, who dispersed from the 3 sons of Noah (as described in Genesis 9-11) to have shared traditions about this event? Well, that is exactly what we have. So, of course I believe in shared traditions and parallel accounts, but most of the non-Scriptural parallels are filled with total absurdities. Yes, I know, many believe, as perhaps you do, that Hebrew scribes were just smart enough to de-mythologize such accounts, but no need to debate that here. What matters is, yes, I believe all of mankind had shared traditions and parallels for the early history of the earth, and that includes details from the creation week. Hi, thanks for the response, and thanks for acknowledging that it does exist. The problem I have (Alongside the fact that I don’t think Genesis teaches an accurate cosmogony of the universe, I share Walton’s view) is that I don’t believe that your response can explain away all parallels, such as the link between Isaiah 27 and Psalm 74 with the Baal Cycle.